Mailboxes showcasing dogs, cats and even pink flamingos are only a couple of the strange mailboxes you might see just about anyplace that mailboxes can be found. Whether they are sitting by the road or connected to the home, home owners are choosing to use more and more unique mailboxes than ever before. So long as the homeowner’s distinctive mailbox still satisfies the requirements set forth by the USPS, there is absolutely no end to the kind of mailbox you can feature at your home. Initially, plastic covers began showing up as coverings for conventional mailboxes. However, as people dreamed of being more inventive with their roadside designs, mailboxes began showing up as a variety of animals, and crafted designs. Strange mailboxes can even be replicas of useful things, like a car or fire truck. In addition, many unusual mailboxes feature the homeowner’s favorite breed of dog or even zoo animals. 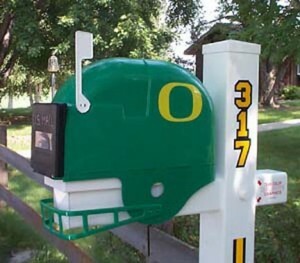 About the sole limit on one of a kind and unusual mail boxes is the homeowner’s imagination. Homeowners do not need to have any skills for making their own mail box, as a brand new industry has emerged in making their desire for a rare mailbox becoming reality. Keep in mind, before you buy a unique mailbox it is critical to ensure it meets USPS regulations. If it does not, your letter carrier possibly will not deliver your mail. In its place will be a short note advising you your mail has been returned to the local post office where it will be readily available for pick up up until you install an acceptable mailbox. There are various companies that offer mailboxes of uncommon designs and most of those organizations ensure that their designs all meet those polices. Naturally, you can take a weekend to construct your own personal unique mailbox. Mail boxes, like those designed to look like big mouth bass, whose mouth opens for the mail or the ones that look like a host of other animals, motor vehicles or replicas of the homeowner’s house, could add a certain flair to your scenery. Of course, you should undoubtedly ensure the mailbox does fit with the outside style of your home, when possible. For instance, when you have an extremely modern home but a fascination for the Old West, it will be unreasonable to assume a Wild West mail box would suit your home’s outside design. Real estate agents might tell you this is only an issue if you are trying to sell your home, however. Furthermore, talk with your Home Owner’s Association to make sure changing your mailbox will not be a problem. If you want to stand out from the crowd, unusual and unique mailboxes can allow you to do so in a very easy and subtle way.